The People's Republic of China is undoubtedly pre-eminent amongst all international friends of Sri Lanka. China is our paramount protector in the Security Council and the General Assembly of the United Nations. Chinese assistance was utmost in the war against separatist terrorism. Moreover, China provides the broadest possible contributions for our development projects. Hence the era of President Mahinda Rajapaksa will go into history as the most glorious episode in the relationship between Sri Lanka and China. This certainly is not a spontaneous situation. Chinese Leader Deng Ziao Ping addressing the United Nations summit in 1974 stated that, "Those who fetch water from a well must never forget the people who dug the well", directly indicating the initiators of international friendship. Hence there is no better occasion than today to commemorate the pioneers of friendship between Sri Lanka and China. Even though our nations share a rich heritage, including the visit of Venerable Fa-Hsien during the Anuradhapura era, the steady development of Sri Lanka - China relations commenced only after the victory of the Chinese Revolution in 1949. Three types of international relations are practiced in the People's Republic of China, namely: state to state, party to party and people to people. By about the year of 1949, the Ceylon Communist Party had established bi-lateral relations with the Communist Party of China, arranged through the "Communist Information Bureau" headquartered in Moscow. This brought to fruition an endearing friendship. The victorious march of the Red Army of the Chinese Communists towards the Kuoumintang capital- Nanjing, was reported promptly in the pages of "Mawbima", the weekly organ of the Ceylon Communist Party. A search through the National Archives will prove how informative these large articles are. From L-R Sudharman De Silva Dharmawardena (Treasurer-Sri Lanka China Friendship Association) Theja Gunawardena (President - Sri Lanka China Friendship Association) Ananda Kumara (General Secretary - Sri Lanka China Friendship Association) Badra Gunathilake- Asst. Secretary with Lin Lin the President of the Chinese People’s Association for Friendship with Foreign Countries and with Chinese diplomats in 1957 establishment of Diplomatic Relationship between two countries. The Government of Ceylon recognized the Peoples' Republic of China as a sovereign state on January 6, 1950. After such recognition, the development of cultural, trade, economic and diplomatic ties would have followed. But the United National Party Government in 1950, who obviously followed British interests in recognizing the new born state - China, was never so keen to develop further bilateral relations. The necessity of a broad mass movement to pressurize the Government was quite obvious. No one can suppress the fact that the organizational and publicity process to introduce People's Republic of China to the people of Sri Lanka was inaugurated by the Ceylon Communist Party. The weekly "Mawbima" and magazine "Navalokaya" edited by respected progressive Buddhist Monk - Ven Udakendawela Saranankara Thera spearheaded the publicity campaign to promote New China. The Ceylon Trade Union Federation of the Communist Party published a 130 page book called "Peking Panividaya" and distributed it for 50 cents a copy in 1950. The next obvious step was to unite all friends of China who were inspired by the movement of publicity in to a single organization. Mrs Theja Gunawardena, a well known intellectual, who had a close friendship with the Communist Party was the leader who pioneered this project. The plumule of the present Sri Lanka China Friendship Association was inaugurated by Theja Gunawardena and the Ceylon Communist Party as, "Lanka-China Friendship Union" in 1950. Dr G V S de Silva, an economist attached to the University of Ceylon, Peradeniya, who was a Central Committee Member of the Communist Party was the first secretary of "Lanka China Friendship Union". Mrs Kusuma Gunawardena, Member of Parliament who was one of the leaders of 'Viplawakaari Samsamaja Party'(VLSSP) was appointed as the President, as there was an alliance between Communist Party and the VLSSP in 1950. This "Union" did not last long and was soon defunct. Finally on Monday the September 22, 1952, it was completely reorganized at the residence of Dr Kumaran Ratnam as "Lanka-China Friendship Association" with Theja Gunawardena the dynamic live wire of the movement being elected as the President. 1952 was a period of severe economic turbulence in this country. We could not market our rubber to the world. Ceylon faced a food problem due to the high price of rice in the world market. In order to surmount this situation the Lanka - China Friendship Association and Communist Party launched a mass movement to agitate to sell our rubber to China and to buy Chinese rice. This movement was led by Ven, Udakendawela Saranankara Thera. "Nawalokaya" magazine edited by Saranankera Thera, which was very popular among Sinhala reading public, published a special issue and it was advertised in "Mawbima" with a simple heading, "China Rice!". Agitations for "China Rice" were organized in all big cities to protest against the rising cost of food. 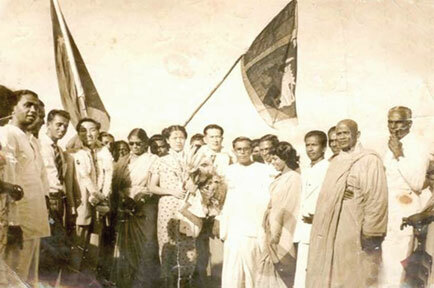 The largest agitation for "China Rice" was held at Peliyagoda in September 1952 under the direction of the Ven Thalpawila Seelawansa Thera, who was an active friend of China. In the cabinet of the U N P Government J R Jayawardena, Finance Minister, strongly opposed buying Chinese rice but the Minister of Trade R G Senanayake represented the aspirations of the starving masses. On December 18, 1952 the famous Ceylon - China Rubber - Rice Agreement was signed in Peking. This bilateral trade and economic pact was the first state level agreement signed between Sri Lanka and China and it was a direct and clear result of the island wide mass movement led by the friends of China. Friends of China in Sri Lanka who were elated by the Rubber - Rice Pact launched their next demand to establish full diplomatic ties between our nations as soon as possible. An uninterrupted mass movement was carried on from 1952 up to 1957 for this demand. It was launched by Lanka-China Friendship Association and was actively supported by the left parties led by the Communist Party and the newly formed Sri Lanka Freedom Party. Respected Buddhist priests, well known artists and intellectuals took part in the movement. When S W R D Bandaranaike openly promised that he would establish diplomatic ties with Socialist countries once he becomes the Prime Minister, this movement became a vanguard to promote Bandaranaike for the Premiership. Ven Udakendawela Saranankara, Ven Naththandiya Pannakara, Ven Bambarende Siriseevali, Ven Thalpawila Seelawansa, Ven B Narada, Theja Gunawardena, Badra Gunathilake, Ananda Kumara, Sudharman de Silva Dharmawardana and Dr G V S de Silva were the leading friends of China who tirelessly worked in their movement. Victorious Bandaranaike who became the Prime Minister on April 12, 1956, promptly fulfilled the promise he had given to the friends of China within just nine months. The legendary Chinese Prime Minister Chou En-lai visited Sri Lanka on January 31, 1957 to sign the agreement of establishing diplomatic ties. The Lanka - China Friendship Association organized a very successful meeting in the New Town Hall, Colombo 7, to celebrate this occasion, and the fact that both Prime Ministers, Bandaranaike and Chou En-Lai addressed this meeting was a historic and significant event. After the demise of Premier - Bandaranaike, friends of China rallied their forces behind Prime Minister Sirimawo Bandaranaike and launched a dynamic political movement in most of the cities and around the country at the General Election of 1965. Many leaders of Lanka - China Friendship Association including Ratne Deshapriya Senanayake (former President of the Association) contested the 1965 election representing the United Front led by the Sri Lanka Freedom Party. Kandy, Galle, Kegalle, Jaffna and Anuradhapura branches of the Friendship Association along with Ven Naththandiya Pannakara Thera, Theja Gunawardena, Ananda Kumara, Sudharman de Silva Dharmawardena, Bhadra Gunathilake, Yasa de Lanerole, Ratna Deshapriya Senanayaka and other leaders actively took part in a tireless, sleepless election campaign to guarantee the victory of Prime Minister Sirimawo Bandaranaike. The defeat of Bandaranaike and the SLFP led United Front paved way for utmost difficulties to the friends of China from 1965 onwards. The U.N.P. led reactionary coalition who took office on March 22, 1965 launched an open persecution campaign against China and also friends of China. Ratna Deshapriya Senanayaka was framed and dragged in to a commission of inquiry into CWE (Sathosa) activities. The propaganda machinery of the U N P Government highlighted an incorrect story backed by some photographs and alleged that two Chinese persons were trying to harm Prime Minister Dudley Senanayake. This story caused a situation of white terror to the local Chinese elements who were residing in Sri Lanka from the 1930's. The U N P Government used the Customs Department to prevent the release of Mao Ze Dong badges, little red books which carried Mao's quotations, other Chinese publications and popular Chinese magazines which were sent to the Embassy of the People's Republic of China in Sri Lanka under normal diplomatic channels, which was covered by the Vienna Convention. Praja Bookshop (Praja Prakashakayo) and Praja Printing Press of Lanka - China Friendship Association administered by Ananda Kumara and Sudharman de Silva Dharmawardena on behalf of the Association were constantly watched by the agents of the C I D of the U N P regime and they were personally harassed. The 1965/66 era was the only period where a Government of Sri Lanka openly launched an anti Chinese campaign since the establishment of diplomatic ties between two countries. The trustful trio who bravely fought against this campaign of anti - Chinese terror to safeguard all friends of China with the able assistance of the other members of the Friendship Association, who worked through day and night for the release of Chinese publications and who also fought against the baseless persecution of local Chinese dental mechanics, shopkeepers and hoteliers were Theja Gunawardena, Ananda Kumara and Sudharman de Silva Dharmawardena. Pro U N P anti-Chinese elements and reactionary religious and monitoring circles tried their best to unleash a reign of terror against the friends of China during the period of Tibetan rebellion in March 1959 and also during the Chinese - Indian border war of 1962. But Prime Minister Sirimawao Bandaranaike and the Sri Lanka Freedom Party Government effectively prevented all such endeavours. Some reactionary politicians and certain police officers tried their best to create an anti - China campaign during the period of 1971 insurgency. But Theja Gunawardena and Sudharman de Silva Dharmawardena tirelessly worked pell - mell, keeping constant contact with Prime Minister Bandaranaike, and her Secretary Makie Ratwatta to save the friends of China. Theja and Sudharman are eternally admired for their energetic endeavours to pave way for freedom to the friends of China who were arrested and detained under emergency regulations including the writer Karunasena Jayalath, journalist Dharmasiri Jayakody, scholar professor Pushpakumara Premaratne, and Attorney Kalyananda Thiranagama and myself. Anti Chinese conspirators were forced to retreat in 1971 after the famous statement issued by Chinese Premier Chou En-lai criticizing the 1971 insurgency. China achieved her lawful position in the United Nations in 1971 and the Government of Sri Lanka campaigned for China in all international lobbies. The vehement propaganda organizational campaigns of Lanka - China Friendship Association and all friends of China in Sri Lanka carried out for 21 years had quite definitely created the staunch foundation for the governing party and also for the Government of Sri Lanka to uphold its principled stand to promote China in the United Nations in 1971. The friendly feelings cultivated among the people of Sri Lanka by the friends of China was so strong, that the U N P Government that assumed power after 1977 practiced a policy that was very friendly towards the People's Republic of China. Those good sentiments were clearly elaborated when Dr Wickrama Weerasooriya who spearheaded the U N P propaganda campaign that brought a massive victory to the U N P in 1977 and who was promoted to a very powerful position of the secretary to the Ministry of Plan Implementation in the U N P regime officially called a meeting at the National Operations Room in the Ministry in 1981 to organize a society to develop friendship between Sri Lanka and China.